Bagan (formerly Pagan) was built from the mid-11th to near the end of the 13th centuries, when it was overrun by Kublai Khan's invading forces. In its glory days, Bagan was a major Buddhist center and a thriving city of at least 300,000 people along the banks of the Ayeyarwady (Irrawaddy) River. The people erected over 10,000 pagodas and monasteries. Some 2,000 edifices still stand. The rest suffered chiefly from human neglect and earthquakes. It occurred in 1975. Many structures that had survived the centuries were badly damaged - and one of the largest Bagan pagodas irretrievably collapsed into the river. Fortunately, archaeologists have restored many key structures. 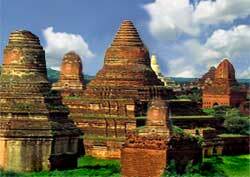 The three most famous Bagan pagodas are the Thatbyinnyu, Ananda and Shwezigon Temples. It's the tallest Bagan pagoda (high as a 17-story modern building). Though slightly shorter than Thatbyinnyu, it is one of the oldest yet best preserved Bagan pagodas. Four tall standing Buddha statues peacefully adorn its corners. This is the holiest of the Bagan pagodas. Its impressive gilded bell-shaped stupa houses relics of Buddha.